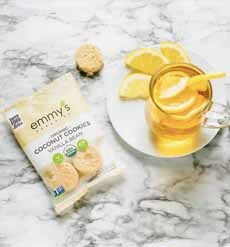  Emmy’s Organics cookies are made with shredded coconut. 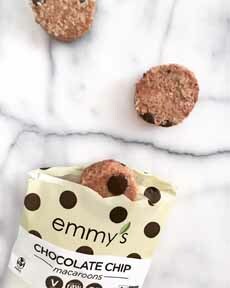 They’re macaroon-style treats in different flavors (photo courtesy Emmy’s Organics). Each chewy cookie is delicious on its own or with a beverage (photo courtesy The Balanced Beet). How can you resist? Head to Walmart, use the store locator or order online. THE NIBBLE is an omnivore publican. We eat everything. The only differentiator is that it has to be delicious. With an evolution in consumer eating to more foods that are organic, gluten free, soy free, sustainable, non-GMO and vegan, many tasty products that meet these criteria are now available on store shelves nationwide. 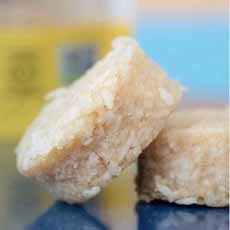 One that crossed our desk recently is Emmy’s Organics Coconut Cookies. They’re a real find for coconut lovers, regardless of diet preferences. You can find them at Walmart stores nationwide and via this store locator. The Vanilla Bean flavor (photo #1) tastes like a lighter coconut macaroon. In an earlier package design, the cookies were labeled macaroons, as you can see in photo #2. In addition to Vanilla Bean, we tried Peanut Butter, the other flavor that is available at Walmart. The line is certified kosher (pareve) by Earth Kosher. See the ingredients below†. Check the company website for the latest selection. Because the coconut creates a chewy cookie, just one of the 1-1/2″ rounds, paired with a beverage, is satisfying snack or dessert. We like the “leisurely chewing” they offer. And because the cookies are crumbly, they can be topped with flavored yogurt, chocolate frosting, etc. to make “tartlets,” crumbled over ice cream, etc. The only limit is your imagination. *Golden milk is a healing beverage Ayurvedic and Chinese medicine. It combines turmeric and black pepper with coconut milk. Ingredients include organic coconut, organic agave syrup, organic almond flour, organic coconut oil, organic vanilla extract, organic vanilla bean powder and Himalayan salt. St. Patrick’s Day, March 17th, is one of those holidays that everyone likes to celebrate. Some attend a parade, some head to pubs. But our favorite activity is casual entertaining at home with friends. Our friends love to bring food to a gathering. So we have a group feast, without anyone doing too much work. Don’t forget the Irish Coffee. If you’re on a budget, you don’t have to buy green napkins, cups and plates. But pulling together some Irish music is a good idea: Maybe your friends can help with that, too. The drinking toast is sláinte, “health” in Gaelic. It’s pronounced “SLAN-chuh” or SLAWN-chuh. Leprechaun lemonade can be served as a soft drink, or with Irish whiskey. Here’s the recipe, along with recipes for green beer and green ranch dip. There are different cheeses to create an Irish cheese board, but you can also sprinkle herbs with a shamrock cut-out (photo courtesy Vermont Creamery). Brussels sprouts with bacon jam, as an appetizer or beer/wine snack (photo courtesy Pampered Chef). While large Brussels sprouts are tempting, smaller ones are more tender (photo courtesy Sweetgreen). With St. Patrick’s Day ten days ahead, we begin a series of festive recipes. This recipe from Pampered Chef is both fun and tasty: Brussels sprouts, cooked in bacon drippings, topped with bacon jam (photo #1). You can serve it as an appetizer, a side, or a beer/wine snack. Use any leftover bacon jam with crackers or brie (baked brie or on a cheese plate)—or on toast. 1. COOK the bacon in a large skillet over medium heat until crisp. Remove the bacon from the skillet and drain on paper towels. Drain the grease from the skillet, reserving 1½ tablespoons of the bacon drippings. 2. ADD 1 tablespoon of drippings back into skillet. Add the onions, garlic and thyme. Cook over medium-low heat 2-3 minutes, or until the onions are tender. 3. CRUMBLE the bacon into a small mixing bowl and add the onion mixture, preserves and vinegar. Mix well. 4. HEAT the remaining drippings in the skillet. Add the Brussels sprouts and cook, covered, over medium-low heat for 8-9 minutes, or until crisp-tender. Turn the sprouts halfway through. 5. ARRANGE the Brussels sprouts cut-side up on a serving plate or board. Top with bacon jam. While National Pie Day is January 23rd, March 14th, 3.14, is National Pi Day. The date format 3.14 is the same as the first three digits of pi. The first 10 digits are 3.1415926535. There are many more: Pi has been calculated to more than one trillion digits beyond its decimal point. Some people are obsessed with memorizing as many digits of pi as possible. The Guinness Book Of World Records names the record holder as a man named Lu Chao. He set the record in November 2005 at Northwest A & F University in the Shaanxi province of China. It took him 24 hours and 4 minutes to recite the 67,890th decimal place of pi without a mistake. It’s a great achievement, but we’d prefer to eat pie than to memorize pi. For March 14th, bakers and mathematicians alike have fun baking pi-themed pies. If you’ve forgotten high school math, pi is the ratio of the circumference of a circle to its diameter. The number is constant, no matter what the size of the circle. The pi symbol is the Greek mathematical symbol that represents the ratio. Because pies are round, it’s particularly fitting to have one today. We use Pi Day as an excuse to have a different type of pie each year. Almost any pie can be decorated for the occasion, from apple or other fruit (photos #2 and #3) to Key lime to pecan or pumpkin (photo #1). You have enough lead time to have a Pi Day dessert party. Eight people can share one pie. For a larger event, invite friends to bring their favorite pies. If you don’t have time to bake, pick up a pie and the garnishes to create the pi symbol (berries, marzipan, mascarpone, etc.). To see some different creative approaches to decorating the pies, search for “Pi Day pie” on Google and Pinterest. Pi Day was founded in 1988 by Larry Shaw, a physicist at the San Francisco Exploratorium. On that first day, both staff and visitors celebrated by marching in a circle, and then eating fruit pie. On March 12, 2009, the U.S. House of Representatives passed a non-binding resolution (111 H. Res. 224) recognizing March 14, 2009 as National Pi Day. The tradition expanded across the globe among countries that use the month-day format (i.e., 3.14). Who on this earth doesn’t want a reason to eat pie? Some bakers make a pastry cut-out of the pi symbol to decorate the top crust (photo #1). Some actually decorate the rim of the pie with the first 31 digits of pi (or however many fit—photo #3). You do it with cookie cutters in the shape of numbers. If you go for savory rather than sweet, a pizza pie fits right in. A simple pie pie: A single crust pie with the pi symbol cut from the rest of the dough (photo courtesy From The Mixed Up Files). Get cookie cutter numbers to create the formula (photo courtesy King Arthur Flour). We wish we had the patience to apply all these decimals of pi (photo courtesy Great Minds Of Science | Tumblr). If you’d rather have a pizza pie, it counts. This one is decorated with pepperoni (photo courtesy Real Life At Home). Pepperoni is the perfect medium to create the pi symbol (photo #4). You can add other favorite garnishes around the rim. Some brands are regional. Some start out that way and become so popular they get national distribution. Such is the case with Cheez Doodles from East Coast manufacturer King Kone, vs. Cheetos from Dallas-based Frito-Lay. Both are puffed, cheese-flavored cornmeal snacks. Both began as regional brands, and became national powerhouses. March 5th is National Cheez Doodles Day. You’ll find online that some small sites claim March 5th is National Cheetos Day; but it isn’t. Even though they are more than 10 years older, Cheetos needs to establish its own holiday. The Cheez Doodles brand was originally developed and manufactured by King Kone Corporation of the Bronx. Melt-in-your-mouth and very cheddary, it became the prevalent cheese puff snack on the East Coast. But King Kone? Where did that name come from for a cheese puff producer? The company was originally a manufacturer of food machinery. In the early 1950s, they decided to manufacture foods instead of just selling the machinery. Their first product was making food ice cream cones. One of their machines could extrude cornmeal under pressure through a narrow hole, which was then cut into three-inch lengths by a blade. Baked with orange cheddar cheese and flavorings, the product was dubbed Cheez Doodles by company’s co-owner, as he was sitting a table with other employees sampling different alternatives for the cheese flavor. Cheese puffs, cheese curls, cheese balls and cheesy puffs are all names for a puffed corn snack, coated with a mixture of cheese or cheese-flavored powders. They are manufactured by extruding heated corn dough through a die that forms the particular shape. Eat them from the bag, from a bowl, or for very neat people, shake some onto a plate and serve with a napkin. Cheez Doodles fanatics have used them as an ingredient in other foods, as well. In 1960, King Cone Corporation was renamed as Old London Foods. In 1965, the company was bought by Borden, which made Cracker Jack and Drake’s cakes. It has been sold several times since. Most people snack out of the bag or a bowl. But we found these 10 additional uses for Cheez Doodles that include Cheez Doodle Pie, Cheez Doodle macarons, Cheez Doodle Snickerdoodles, chocolate-dipped Cheez Doodles, Peanut Butter & Cheez Doodle Sandwich. This article has similar ideas for Cheetos: top the cheese on a cheeseburger or grilled cheese sandwich, Cheetos nachos (instead of tortilla chips), mac and Cheetos and Cheetos sushi. We’ve even seen crushed Cheez Doodles/Cheetos for breading chicken, a garnish for corn on the cob, and Cheetos marshmallow krispie treats. Cheetos were invented in 1948 by Charles Elmer Doolin, who created Fritos corn chips in Dallas, in 1932. The snack sold briskly, but Doolin did not have the capacity to produce and distribute the snacks nationwide. In order to expand, he subsequently partnered with potato chip producer Herman W. Lay to market and distribute Cheetos. While Cheetos was the first cheesy snack puff, other major U.S. brands include Herr’s Cheese Curls, Wise Cheez Doodles and Utz Cheese Curls. As of 2010, Cheetos was the top-selling cheese puff in America.